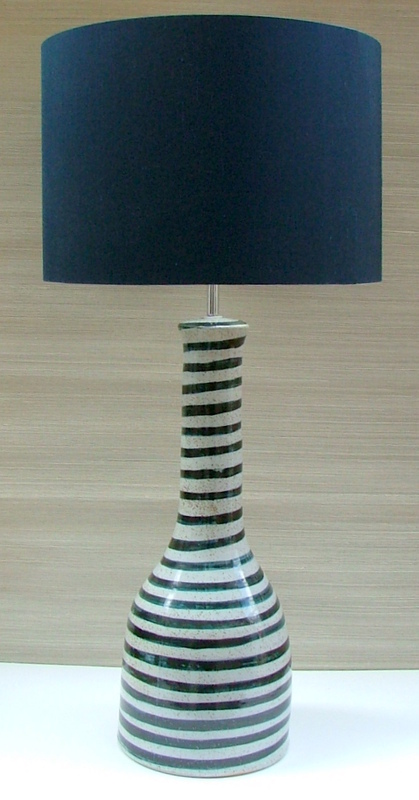 JOSEPHINE table lamp finished in Graphite Black with Paprika silk shade. ST PIERRE table lamp finished in Sea Salt finish. Midnight Blue lampshade. 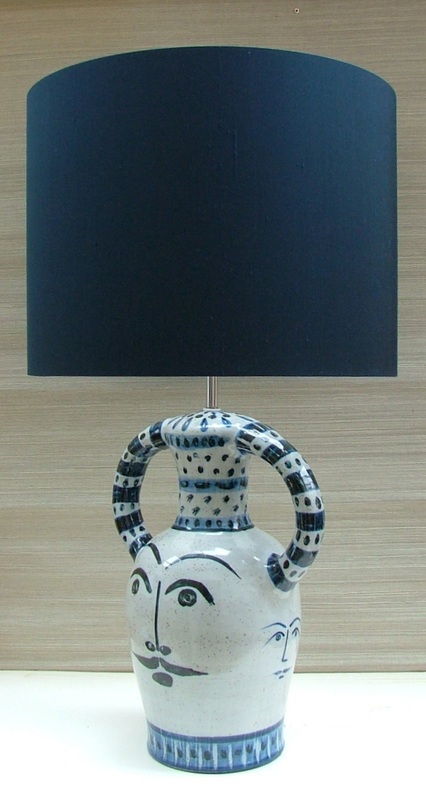 FOXTROT table lamp finished in Russian Gold with Charcoal Black shade. FONZIE table lamp, finished in Bright Gold with Gold lampshade. Kinkatou is all about art, sculpture, ceramics and aesthetic objects as statement lighting. The vital key piece that pulls the scheme together, which is beautiful, unique and functional. Blue and white is proving an interiors trend. 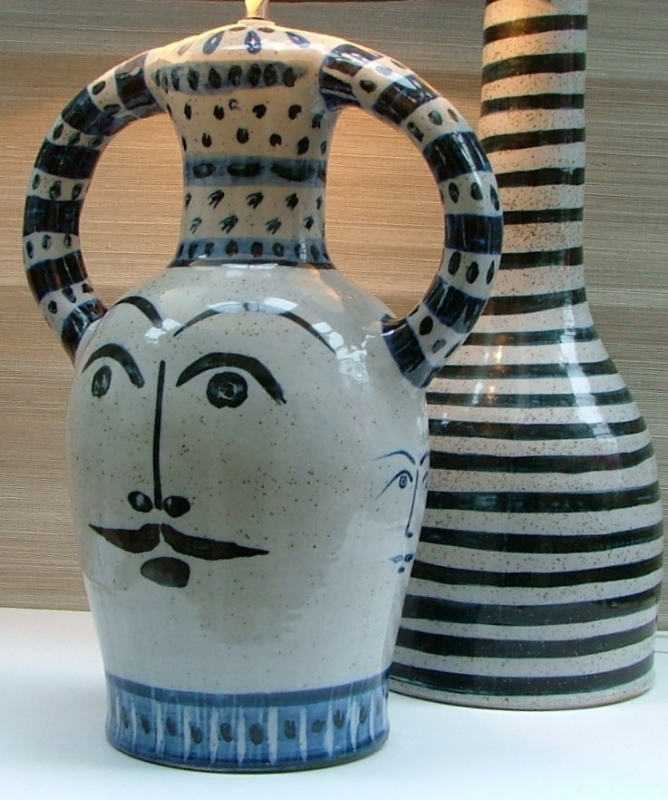 Our new blue and white contemporary ceramics are reminiscent of those currently very fashionable Mediterranean artists that were working in the 1950’s and 1960’s on the French Riviera. The hand painted creative and playful images are indicative of sunny days on the Cote d'Azur. Bold, bright, and full of energy, these lamps create an impact and stand at impressive heights. Characterful, artistically and playfully painted with creativity and crisp bright lines of cobalt and light blue. Add an element of fun with a contemporary ceramic and eye catching piece. Essentially modern with a vintage and summery feel, and nostalgic of those popular and collectable mid century renown ceramic artists and fitting with the hot trend of blue and white ceramic look. It stands at a proud height of 90cm including the shade. The width at widest point of the arms is 35cm, the diameter of the base 20cm. Pictured here with Midnight Blue shade 37cm high and 50cm diameter. The height of the ceramic base 48cm. There is a real movement and appreciation for contemporary craft revival and handmade products made in Britain. All of our pieces are made by talented British craftsmen in the UK and we do bespoke sizes, shapes, colours and finishes on most of our pieces. Here are some handpainted in the most joyful of blues, the key interior trend of colours making waves this season. Ideal for a bold edgier statement at the forefront of a neutral backdrop and design scheme. Smart stripes with the blue-black edge which is sleek and modern, it makes a plain but simple decorative feature. A contemporary, striking, strong and confident piece, hand painted and unusual. Pictured here with a Midnight Blue silk shade. The piece stands at an impressive height of 97cm inclusive of shade. The latest in trends, our #ideastoshare, news and scheme boards sent to you by email.